Make sure the sexual enhancement supplement you take passed our test and is right for you! Do sexual enhancement supplements work for men or women? 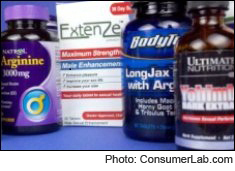 Certain supplement ingredients may help treat erectile dysfunction in men. Some ingredients and formulas may also increase libido (sexual drive) in men and women, although the evidence for this is limited. The next question is, which supplements for sexual enhancement actually provide ingredients that might work, at the right dosage, and without contaminants or illegally added drugs? To help answer this question, ConsumerLab.com purchased a variety of supplements intended for sexual enhancement containing popular ingredients such as yohimbe, epimedium (horny goat weed), and L-arginine. Among the ten selected products, only three passed quality tests. Four contained less of a key ingredient than claimed on the label, one was contaminated with an unacceptable level of lead, and two products lacked FDA-required information on their labeling. None of the products, however, was "spiked" with drugs for erectile dysfunction. You must join to get the full test results for sexual enhancement supplements along with ConsumerLab.com recommendations and quality ratings. You will get results for ten supplements selected by ConsumerLab.com and for one other that passed Voluntary Certification Testing. The evidence for or against sexual enhancement effects of yohimbe, horny goat weed, L-arginine, ginseng, ginkgo, tribulus, maca, Long Jack, and other ingredients. Concerns, cautions, and potential drug interactions for yohimbe, horny goat weed, and L-arginine.